The strong debut of the Sega Genesis was due in part to a line-up filled with ports of it's beloved arcade games like Golden Axe and the fact that the system had the power to come closer to the arcade than any other console on the market at that time. It's hack-and-slash gameplay in one of it's finest forms. The hordes of the vicious warrior mage known as the Death Adder has laid waste to the kingdom, captured the royal family. Out of all the warriors in the land, only three heroes are left to stand against Death Adder and his army. Ax Battler is a barbarian who swings a swift blade and is mildly adept with magic. Tyris Flare the amazon may not do as much damage with her blade, but her speed and potent magic more than make up for that. Gilius Thunderhead the mighty dwarf has very little magic ability, but makes up for it with his battle axe and ability to take lots of damage. These three trek through various imaginative locals of the kingdom that even include a village built upon the back of a giant turtle and another area on the back of a large bird of prey. The designers of the game really went above and beyond normal barbarian fare with those two places. In these places, you'll have to deal with horde lackeys, evil amazons, re-animated skeletons, and giants. In the arcade game, war was over when you killed the Death Adder. In the Genesis cart, you have yet another enemy to contend with. Tyris Flare's magic, speed and dash-kick make her my personal favorite. Take advantage of the low ground. Lure enemies to the edge and start hacking away at those kneecaps and shins while they can't touch you. Each character has different levels of strength, speed, spellcasting skills and durability, so there's no doubt that one will be perfect for your type of gameplay. You attack by hitting the attack button to tap out a combo that ends with a blow that knocks back the enemy. You also have an attack that can surprise an enemy that's trying to backstab. Beyond the standard jump-slash, you can jump higher by leaping while you're running. When you do this, you can also stab straight down at the top of your enemy and do much more damage. You can perform a charging attack by running and hitting the attack button. To add spice to the game, you can also ride on three different creatures (known as Bizarrians) who allow you to move faster, deal out more damage, defend you from injury, and more. One famous hook for this game is its magic system. Grab the magic bottles from the sneaky lil' thieves. The more that you collect before hitting the magic button, the more devastating your magic attack is. This is one of the finer arcade ports in the earlier wave of Genesis carts. In fact, there are quite a few places where you'd have a hard time telling the arcade and Genesis screenshots apart. The scratchy samples may sound horrible to younger gamers of today, but try to remember that these were mind-blowing to gamers who were only playing NES, SMS and computer games with mostly little to no voice. The music was nothing to laugh at and retained the power of the well-written arcade tunes. The controls? Sega's usual brand of perfection. This game has a beginner's mode and a so-called 'arcade' mode that's really one level longer than the real arcade game. There's even a mode where players can go one-on-one against each other or one player can see how long they can survive against groups of enemies in one-screen encounters with no life bar recharges. If you blow through the game and need an extra challenge, that mode'll give you a lil' more to play with. 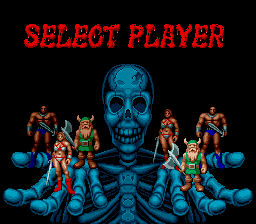 Golden Axe is just basic fun that anyone can pick up and play without much explanation, making it perfect to play for just about any friend who stops by. Of course, the game is much more fun with a second player to hack and slash with. This is one of those games that still stands the test of time in terms of fun. It's a bit short, but that can be said of most arcade game ports. This game isn't hard to find in cart form. The Genesis-less players can find it in the Sega Genesis Collection for the PS2 and PSP. However, the version on the Sega Classics Collection for PS2 is no substitute.